You might be wondering “Where can I get healthy vending machines for my office”? Perhaps you are looking for the top choice to keep your people focused and productive during the workday? It’s our innovative, high-tech vending solutions for New York and the whole US. Employee satisfaction will be greatly increased, and you have the freedom to select the products your employees like the most. So, you are not only making a profit which would otherwise go elsewhere but also better employee experience and health. 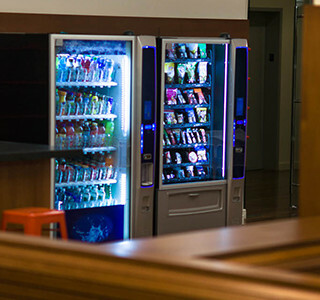 Intelfoods offers vending machine services for small business, office and retail vending machines, as well as services for any retailer out there! Healthy vending machines for offices replace the junk food products with healthier and more nutritious alternatives. Simplify your workflow with a custom vending machine for your office. We are where our consumers are. The term “office vending machine” typically brings to mind a basic snack vending machine that provides workers with a temporary snack getaway. But what if it could be more than that? Save your employees’ valuable work time and a trip to an office supply store by putting all of the everyday essentials at their fingertips in a custom vending machines. You will get full transparency into every transaction via our client specific web portal that allows for live reporting of machine sales, issues and services. This month we are giving away free vending machines and a $500 signing bonus, get it by filling the form. Intelligent Foods on Demand is a leading producer of unique office vending machines for items of any shape and size. Customizable skins allow retailers to display their logo on each machine helping to promote brand awareness and sales in offsite locations. Units can be created in the size most convenient for where it is being placed, whether it needs to be a slim or has enough room to be double-sized. Therefore, our small vending machines for offices improve everyday worklife of employees. The possibility of theft is reduced by reinforced steel and the sturdiest glass available. Extend your store’s reach with Intelfoods that can be placed almost anywhere. We offer all kinds of vending machines, such as Snack Vending Machines, Coffee Vending Machines, Combo Machines (for more types of products) and Beverage Vending Machines. Every retail vending machine for business provided by Intelligent Foods on Demand uses cutting edge technology to track inventory. Instead of having to visit each machine to check inventory levels we monitor our full supply arsenal from any device that connects to the internet. We constantly compare and contrast revenue with stock levels and determine the hottest items in your machines. Intelfoods always protects the safety of your customers with a cashless vending machine that encrypts all credit card transactions and never stores any information. Beef up your cash flow with our generous revenue sharing. We pride ourselves on ensuring that each one of our kiosks is stocked and serviced. Our Vending machines are meant to last for years and anything with that long of a life is bound to run into a snag here or there. Intelfoods has offices all over the United States, ready to respond to any one of our clients’ requests and suggestions of products, placement and any other issues they may come across. Contact us today to find out how our retail vending machines can benefit you by calling (800) 915-9643.
Who would have imagined only a few years ago that you could rent a movie at a McDonald’s®? But with Redbox®, that’s exactly what you can do today. That’s what an automated retail solution can do for retailers. Intelligent Foods on Demand allows you to bring all kinds of products to your customer while profiting, instead of waiting for your customer to come to you. That power is almost unprecedented in the history of selling. Plus, since an Intelligent Foods on Demand requires only electricity to function, you can be selling to your staff and visitors all the time, anywhere you choose. Whether your staff is at work or on-the-go, we’re there too. 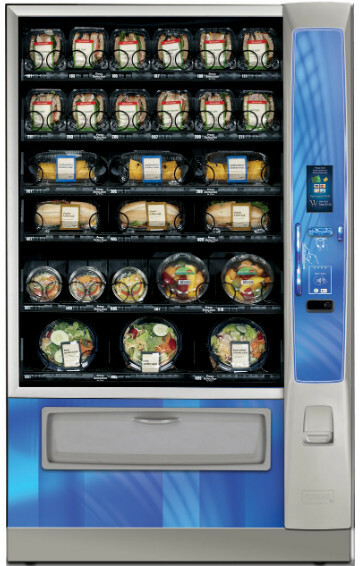 Fresh, healthy, high-tech and inviting, Intelfoods vending machines can be tailored to any environment. We offer the largest variety of products in the industry. From high-value items like electronics or jewelry to inexpensive items like gum, stuffed animals or clothing, all Intelfoods automated retail solutions are physically secured with steel construction so the machines and products are safe no matter where you place the machine. When a retailer works with Intelfoods, we strive to develop a configuration that works best for their unique application. We have a variety of base configurations that can be used to vend everything from small, easily lost items to oversized and bulky items. Your customers can access products using cash, credit cards or e-wallets. Intelfoods uses advanced technology track and dispense items to your customer and to secure any customer information entered into the machine. No credit card information is stored on the machine or on your servers, making all transactions completely secure. We design and develop machines that reflect specific brands and meet footprint requirement. Whether you choose to put an intelligent dispensing machine in-store or out-of-store, this solution is one of the most cost-effective sales techniques that a retailer can employ. No salesperson is needed, freeing up manpower to sell or service in other areas of the store. And, if you choose to place it in an area that receives 24 hour traffic, you can continue generating revenue at any hour of the day. Are you ready to take advantage of your 24/7 selling opportunity? Call us at (800) 915-9643.